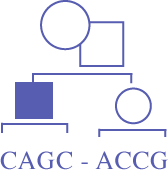 The Canadian Association of Genetic Counsellors (CAGC) is committed to ensuring that individuals seeking genetic counselling services in Canada are receiving these services from an individual with a high level of competency. The process of certification and recertification has been adopted by most professional organizations as a mechanism for assessing and maintaining the knowledge and skills of its practitioners. The process of recertification demonstrates a commitment on the part of the CAGC and its membership to the continued education and improvement of the standards of practice in the profession of genetic counselling. All diplomates of the certification examination of the CAGC have received certified status on a 10-year, time-limited basis. Certification will expire on December 31 of the 10th year from the date the exam was written and passed. Accumulation of continuing practice credits (CPCs) and continuing education credits (CECs). A total of 150 CEC/CPCs must be collected within the 10-year period. A minimum of 20 and maximum of 70 must be CPCs. A minimum of 80 and a maximum of 130 must be CECs. Individuals who do not recertify by examination or by a combination of CECs and CPCs prior to the end of their 10th year of certification will no longer be Canadian Certified Genetic Counsellors and cannot continue to use the CCGC designation. Please review the Recertification Protocol for further details regarding the recertification process. Questions regarding the recertification process and completed applications should be directed to the Certification Board Chair.